After Terry Kath’s death in January 1978, Chicago had a bit of trouble finding themselves. While the 1978 tour with former Steve Stills side-man, Donnie “Hot Licks” Dacus on guitar and vocals was full of the fire and energy of a band embarking on a new beginning with a new producer and guitarist. The 1979 disco follow-up XIII saw a significant drop in sales and the departure of Dacus. After departing longtime label, Columbia Records. Chicago found resurgence with their new guitarist, Chris Pinnick, keyboardist/vocalist Bill Champlin, and svengali producer David Foster. This bootleg captures the energy of that new beginning. For the first time since Terry’s death, the band had someone to cover Terry’s soulful vocals on songs like Make Me Smile in Bill Champlin. While this soundboard recording is exceptional, the performances seem to be sped up, as if the band had gotten caught in the cocaine infused blur of the late seventies and early eighties. Kicking it up from 33 to 45 RPMs—even their prom-fodder; If You Leave Me Now and Hard to Say I’m Sorry sounded a bit more frenetic than on their studio releases. There are some interesting flourishes like the organ intro replacing the normally instantly recognizable piano intro to Saturday In the Park and Chris Pinnick’s hard driving guitar solo on Follow Me—one of Chicago’s most underrated songs. The drum solo which in recent years has been performed by Tris Imboden on the tail end of Beginnings is found instead being performed by original drummer, Danny Seraphine, at the end of the Spencer Davis Group classic I’m a Man. Another interesting addition to the set is Spencer Davis Group’s Gimme Some Lovin’. While I’ve always enjoyed the song, it doesn’t quite sound right with Peter Cetera’s tenor vocals. Bill Champlin’s more soulful baritone would have done much more justice to this classic. One of my disappointments of this set is the lack of vocal interplay between Peter Cetera and Bill Champlin. Part of what made Chicago 16 and later Chicago 17 so appealing was the combination of Champlin’s soulful baritone and Cetera’s soaring tenor. 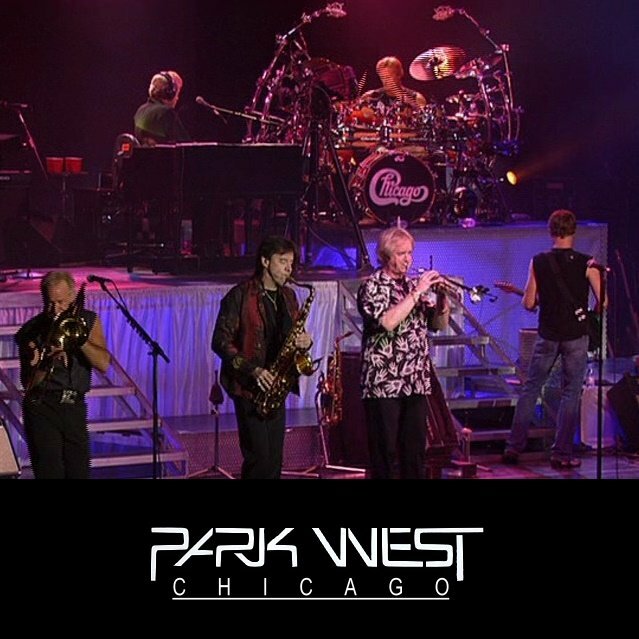 Their vocal styles complimented each other in a way Chicago had not experienced before and has not really experienced since. It’s to Chicago’s detriment that they did not take advantage of the vocal chemistry the two vocalists shared. Despite the shortcomings this is an excellent set from an all-too-brief period in this band's long history. Directly transferred from my original Westwood One 2 LP set, maintaining broadcast order. As far as I know this syndicated concert was aired on radio at least twice by Westwood One. First, as a shorter 60 minute (w/ commercials) version between Dec. 3rd and 5th 1982. Then, as a 90 minute version the week of 10/17/83 in completely different order. The latter broadcast transcription discs are the source of this torrent, approx 76 minutes and some change, total minus commercials. This longer version contains all the same songs, plus more, that were in the original truncated broadcast. Nice sounding show with a few caveats. 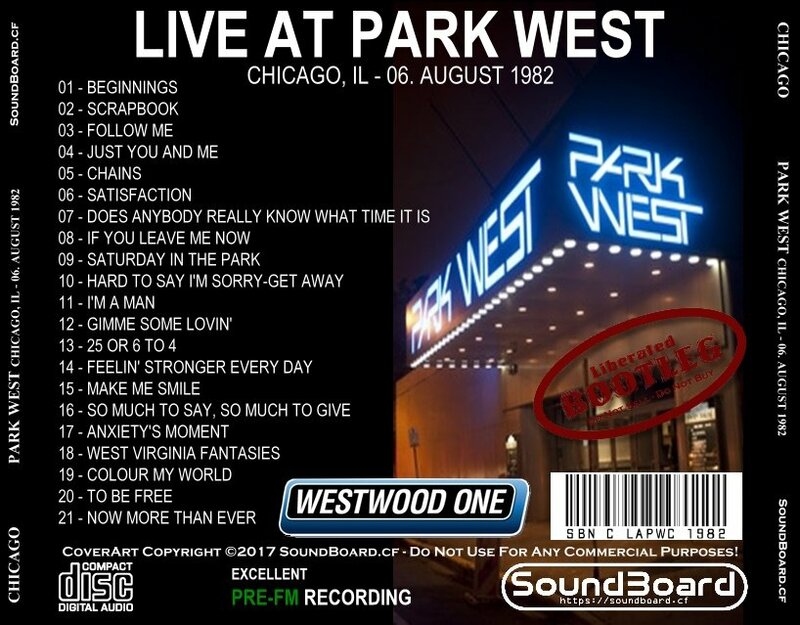 As is often the case with Westwood One LP's from this era, the pressings were cut at an *extremely* low level and geared for FM broadcast, as much as 27 minutes of material on one LP side, resulting in a show that's a wee tad shut-in compared to the absolute very best recordings. I'd still give it a 9 out of 10. Also, due to the low-level cutting of the records, manual de-clicking was necessary to tidy up a few spots. I have done no additional signal processing other than manual de-clicking, editing out of national commercial spots/announcer overlays and some applause merging. Thus, I'll leave any other mastering decisions to the end user. FWIW, from what I've been told, the band played two benefit dates in August of 1982 at the Park West venue in Chicago, IL -- the 5th and the 6th. I'm not 100% positive which of the two were recorded for this broadcast, though the August 6th date has been used before. Thus, I'll simply use August 1982 to be safe. A kind fellow member sent me the tracklist and there seemed to be one track difference (Chains vs. Free Form Intro), as well as this new torrent being about 4 minutes longer. As an added extra, I've also thrown in the original radio promo, placed at the end of the show for nostalgia's sake. Having not heard the other upload, I can't say whether this new transfer is an upgrade (or not) and what differences may exist. Thus, please enjoy this one for what it is -- a show in its pre-FM state. Feel free to distribute this torrent in its original lossless form. Please, do not re-encode as lossy or sell! Special thanks to Luke and Ken for their extensive work and help with this show. Park West 0 out of 5 based on 0 ratings. 0 user reviews.